In my last article I recounted the story of Mike (you can read the entire story here). Assuming you are the general manager of the store in which Mike’s story unfolded, we need to discuss what you would and should do. But first, let’s look at what you should NOT do. You should NOT attribute Mike’s complaint to the odd and unusual circumstance. It is all too easy to simply disregard his complaint as being the result of something out of the ordinary. If it hasn’t happened before it will almost certainly happen again. Instead, take Mike seriously and respond accordingly. You should NOT blame the complainer. We’ve been in business long enough to know that not every complaint is valid and not every customer can be satisfied. But reality begins with the perceptions of others hot you. In fact, the most ineffective leaders always demonstrate a debilitating flaw, the belief that everything would be just fine if they saw things as they see them. It simply is imperative that effective leaders never blame the complainer for his or her perceptions because it is those perceptions that have defined and framed the conversation. You should NOT ignore it. Every person involved – the sales staff in the department Mike visited, the assistant manager he spoke with, and you, all need to know a complaint has been registered and that you do not indent to simply ignore it. Something happened somewhere and it needs to be fixed. It will not get better by itself. You should NOT follow up with a roach letter. For those outside the US, a “roach letter” might seem a puzzling term, but it stems from a complaint letter that an airline passenger sent to the headquarters of the airline following a flight he made on one of their planes. It seems that a passenger awakened from a nap to find a cockroach crawling down his cheek. Incensed, the passenger wrote a letter of complaint and received a prompt response. 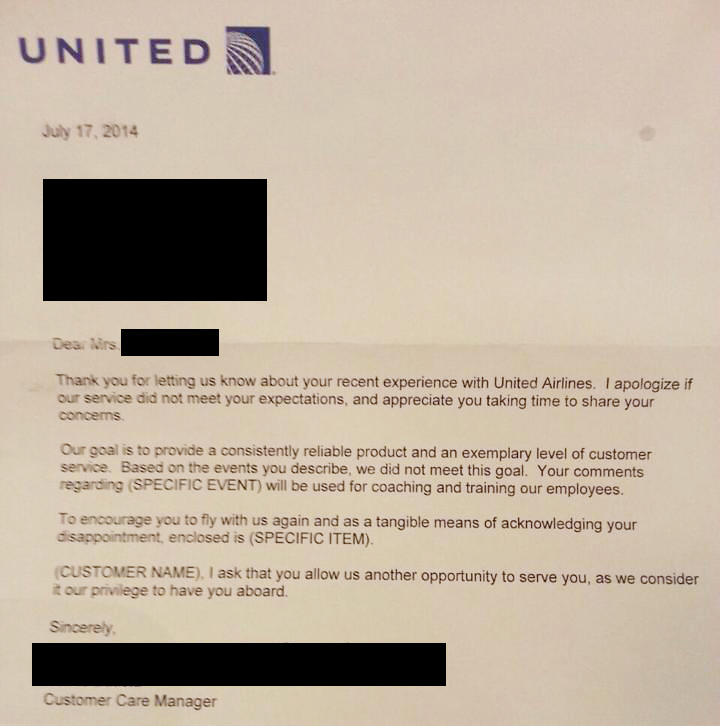 Unfortunately, inside the envelope the passenger found a note from someone in the airline’s customer service department that read, “Send this jerk the roach letter.” Roach letters fix nothing, reveal a terrible attitude, and will always ring insincere. You should not assume your employees will respond badly. Most sales people really do not like to miss out on sales and the incidence with Mike might have been a simple oversight or the result of being too task-oriented rather than people-(customer) oriented. One manager in a big box store ordered one of her top salesmen to stop processing contracts and start putting away stock. This is not unusual when there are lots of things to do but it is a pathetic waste of talent and expertise to divert the completion of sales (profit) toward housekeeping (overhead). Use your talent where they produce the most profit. Indeed, experience shows us that sales people resent being taken away from duties on the floor like meeting customers, selling products, closing on sales to do mundane tasks. If you workplace is structured by paying commissions it gets more imperative to allow the power of incentive to work. Let your sales people sell. In the next post, we’ll discuss what you should do. Mike has filed a complaint. What would you do?